So far, so good. 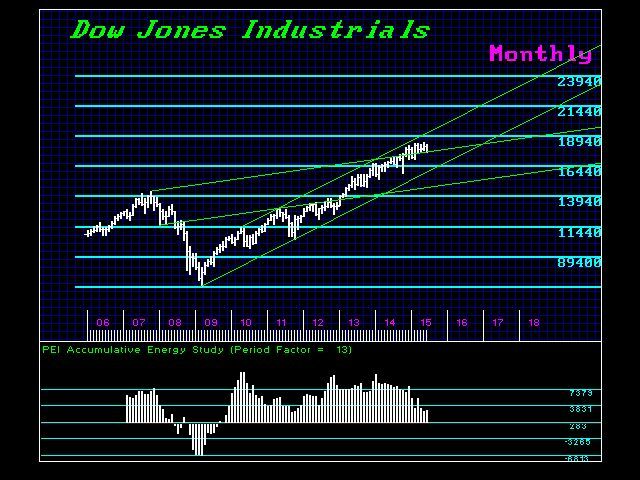 The May high held for June and we achieved the lower monthly closing. Things will be choppy ahead for the remainder of the summer; hopefully we decline into October, leaving the May high intact. This would set the stage for a better recovery ahead. Our monthly Energy Models peaked January 2014 and have been slowly moving lower. This is why we warned there would be no breakout in 1015 before May, which was the first key target in time. Technically, we are in a vulnerable position since the top of the Breakout Channel rests at 1756400 for July. The key support lies at 1706500 and a monthly closing beneath this area will signal a more sharp correction ahead. We have elected a Minor Weekly Bearish reversal and the next lies at 1751000. So a Weekly closing beneath that will open the door to a test of the 1706800 level. Overhead, we need a weekly closing above 1788800 to imply a rest test of the former May high.